(PANAR, ED). Panar, Ed. Los Angeles, CA: Deadbeat Club Press, 2018. First Edition. 8v0. Pictorial Boards. Photography Monograph. As New/No Jacket - As Issued. 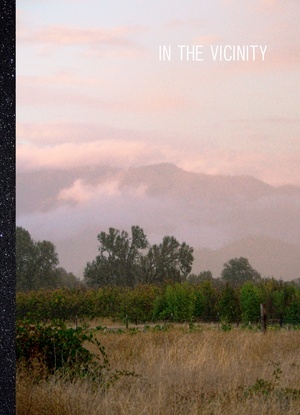 In "In The Vicinity", Ed Panar navigates a remote corner of Mendocino County, an area located within the Emerald Triangle, also known as the heart of California’s cannabis culture. Hidden under the cover of densely forested mountain sides, foothills and valleys, the cannabis plant is leading the way and being tended to: cultivated and revered for its potent economic, psychotropic, and mythological values. We find ourselves in the midst of a secretive world where clandestine operations take place behind rambling fence lines, locked gates, and dusty dirt roads in an ever shifting gray area of legalization, self-sufficiency and raw capitalistic impulses. The plant itself—the primary star of the scene—remains elusive in this Edenic rural atmosphere, where some of the most productive outdoor cultivation of this multi-billion dollar cash crop is occurring just out of sight.